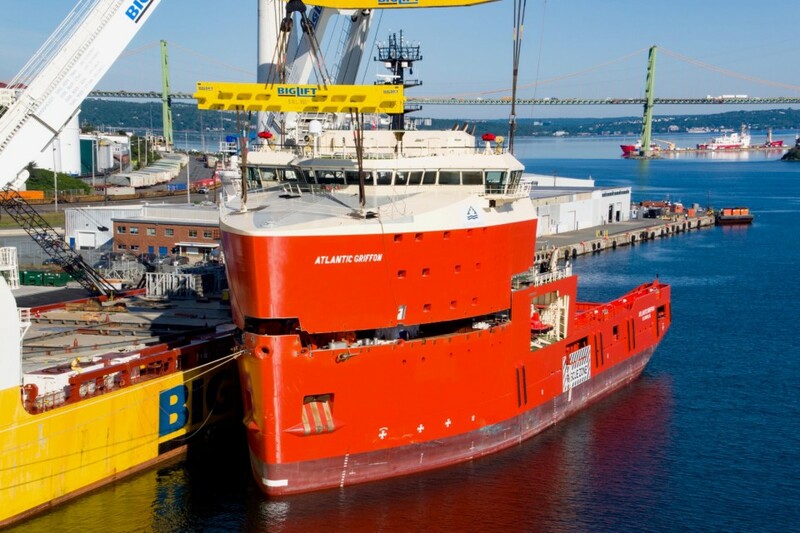 As part of a larger project, Damen Shipyards was asked to build two Platform Supply Vessels (PSVs) in multiple sections in Galati, Romania, with the aim of assembling them in Halifax, Canada. 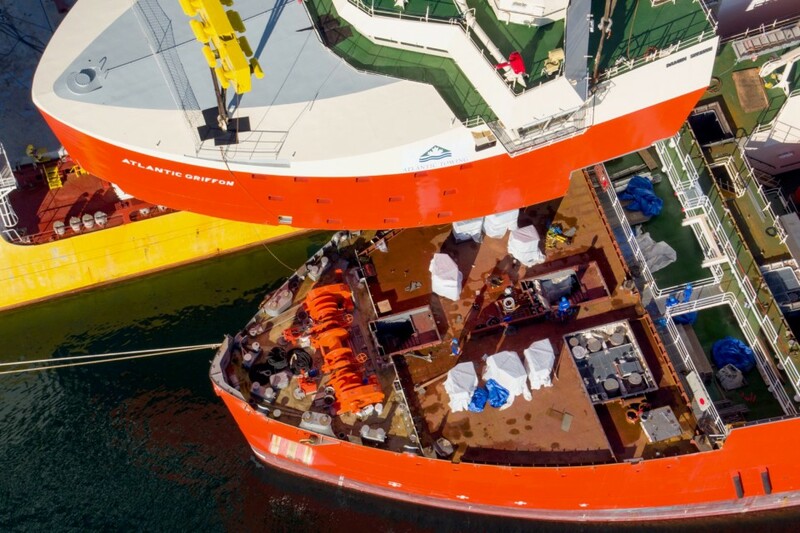 At the start of the project, the division of the ships had not yet been decided upon and Damen assessed the possibilities in close cooperation with BigLift. In the end it was decided that just taking the accommodation units to Canada separately would be the most suitable method for transportation and installation. In Cadiz Happy Sky lifted the accommodation units on board and transported them to Canada while the dead hulls were towed across the Atlantic by seagoing tugs operated by Atlantic Towing. Three years of preparations took place in which numerous drawings and calculations were made. Each PSV accommodation unit weighed 650 mt and was 34 m long, 25 m wide and 22 m high. A base frame was designed to spread the loads on Happy Sky’s deck and to seafasten the accommodation units against the accelerations expected during the sea voyage. The base frame was equipped with six guiding pins, ensuring the correct position of the accommodation units on the frame. Lifting the accommodation units was challenging and was therefore very carefully planned. 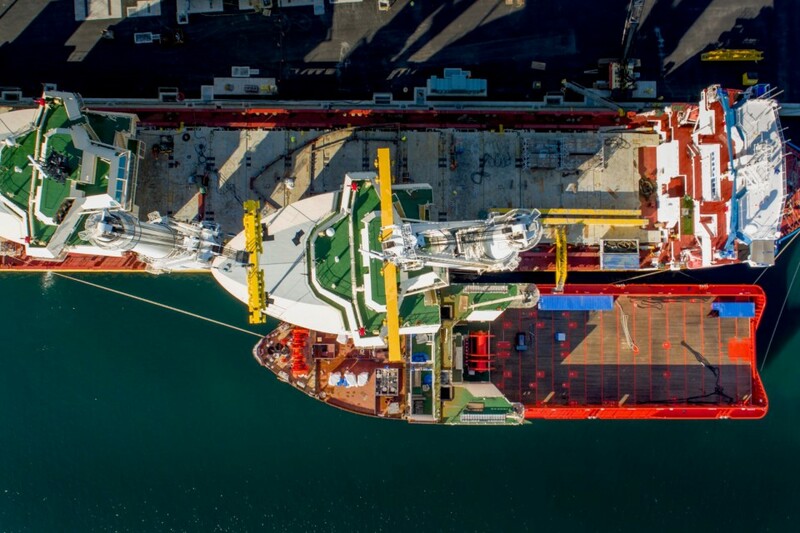 With her own two heavy lift cranes carrying out tandem lifts, Happy Sky loaded the two accommodation units on board. In order to put the accommodation units in the correct order for the discharge operation, the units were subjected to some so-called ‘deckchess’, shifting them around on Happy Sky’s deck using single lifts. So, when the first unit was on board, it was shifted forward on Happy Sky’s deck, with the accommodation unit’s bow leaning over the passage way. Now the deck space between the cranes was available to take the second unit on board. After the loading operation this was repositioned to the aft of Happy Sky and the first unit was then shifted back to its transportation and discharging position between the cranes. For moving the units about on the deck in a single lift action, the rigging equipment was very complex because of the sheer size and weight of the units, and this too had been meticulously calculated and prepared in advance. The loading operations of the accommodation units were thrilling. 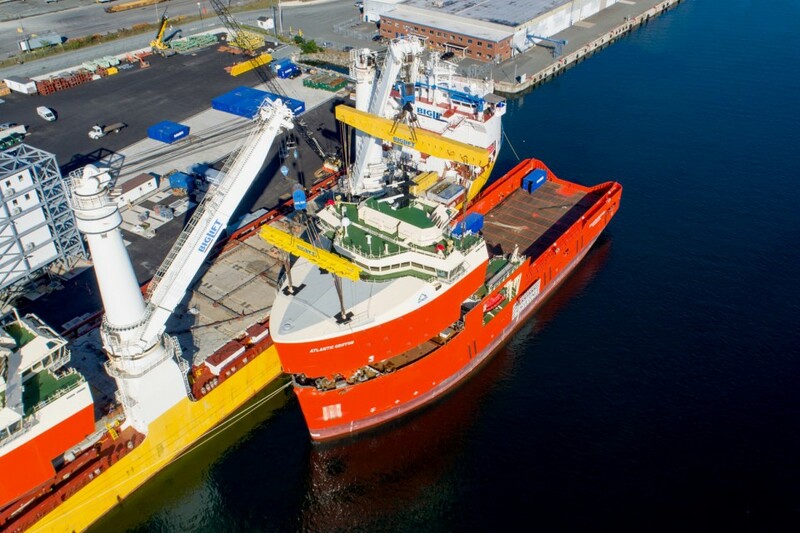 Not only was Happy Sky ballasting continuously to counteract the increasing loads in her cranes, but also the PSV moored alongside had to ballast simultaneously while she was losing the weight of the accommodation unit. Crucially, the crews of both Happy Sky and the PSVs kept in very close communication between themselves and each other for a smooth operation. At one point during the lifting operation of the first unit its portside rose, but the starboard side seemed to remain in its starting position. This was immediately spotted and remedied. As with all lifting operations, the loading was very closely monitored all the time. The lifting operations, including the deck-chess with the single lifts, continued smoothly and soon Happy Sky could cross the Atlantic Ocean. with our valued client Damen before, and we are honoured that Damen involved us in yet another technically challenging project.